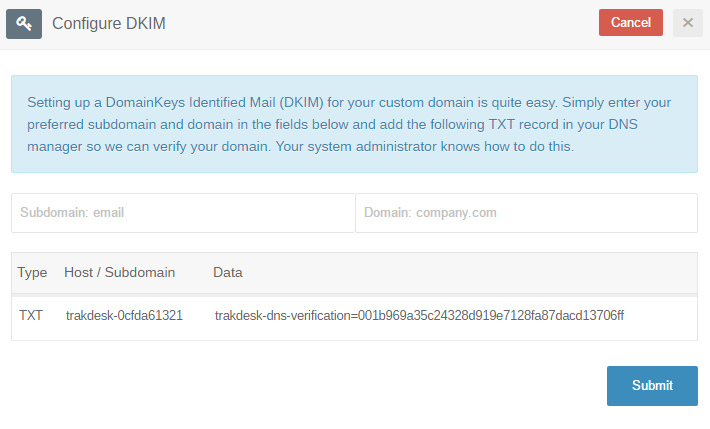 With Trakdesk easy to use DomainKeys Identified Mail (DKIM) configuration wizard, you can setup DKIM for each of your custom domains in minutes. Setting up DKIM has many advantages such as; adding authenticity to your emails. For example; for every email that is sent from your helpdesk whether it was sent by an actual agent or an automated process, it will be signed with your own custom domain. Additionally, the Sent via Trakdesk message will be removed from your emails allowing you to preserve your brand throughout the process. Note: When setting up DKIM for your custom domain, our email provider (Sendgrid) will automatically manage both your DKIM and SPF records. This means you are not required to setup an SPF record in your DNS manager. Authorize Trakdesk to send emails on your behalf by setting up an SPF record. 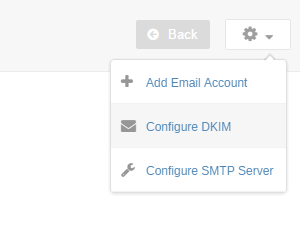 At the Top Right of the page, click on the drop down menu and select Configure DKIM. Once the popup modal has opened, click on the Add button and enter your subdomain and domain that you would like to use. Note: You must add the TXT record in your DNS manager before setting up the DKIM so we can verify your domain. Your system administrator knows how to do this. After the DKIM has been added, you will then need to add the appropriate CNAME records in your DNS manager. Once you have added the CNAME records in your DNS manager, click on the Validate Records option in the drop down menu. If validation is successful, each record status will change to validated, and emails sent from your helpdesk from this point will be digitally signed with your custom domain. Because some DNS providers take longer to update records, records validation many not work on the first try. You will need to allow your DNS provider adequate time to update the records. You can check this by clicking on the Validate Records option multiple times until all the records are validated.